The 2018 FIFA World Cup in Russia is less than two weeks away and football fans the world over are getting ready to support their favorite teams as they compete for glory in the sport’s biggest international tournament. Over the weekend, however, football fans in the UAE were left a little in the lurch as to how they would watch the highly anticipated sporting event. 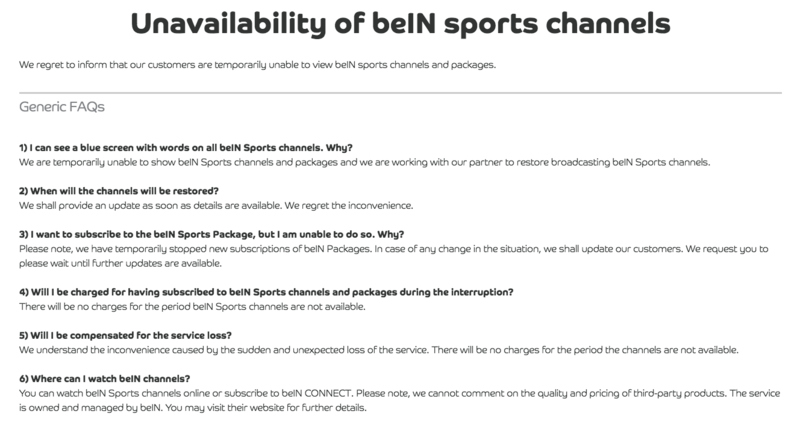 For their part, Du were active on social media confirming to customers that they would not be charged for the service during the period the channels were unavailable and, if customers wanted, they could cancel their beIN Sports subscription without any penalties. An official announcement from Du followed shortly after confirming that all 64 World Cup matches will be broadcast in full HD through a standalone package that customers can subscribe to. A report from Gulf Business, gives a bit more clarification as to the reason why the channels went off-air in the first place. Du had apparently failed to reach a suitable negotiation with the Qatar-based beIN Sports when its initial broadcast agreement ended on May 31. Ok, so what are my options now to watch the World Cup in Dubai? Etisalat announced on Sunday that it will be broadcasting the World Cup as a standalone package for its customers. The package will cost Dhs555 (excluding VAT) and be available on channel 777 of its eLife service. Speaking to Gulf News, a source at the telco said that all beIN Sport channels “are working as normal”. Du have announced the launch of four exclusive beIN Sports channels for the World Cup. The package includes live coverage of all 64 World Cup matches in full HD and will cost Dhs551 (excluding VAT). It’s also interesting to note that in 2014, football website Four Four Two Arabia recalls that that Du rolled out its World Cup package only 15 days before the start of the tournament, meaning that this year they’re cutting it even closer if they want to sign up subscribers. With the opening game of the tournament between Russia and Saudi Arabia set to kick off on Thursday, June 14, football fans in Dubai will not doubt be breathing a massive sigh of relief now that it looks like they will be able to enjoy the summer’s football showcase without fear of missing any of the action. There’s now a free shuttle bus between Dubai and Ras Al Khaimah Eid Al Fitr 2018: When will Ramadan end this year?